Me, Beloved, and family celebrated my brother’s graduation at Ajisen Ramen a few days ago. The particular branch we went to was apparently the original one, at Sto. Domingo street near Banawe. However, this place wasn’t located at a conventional commutable place, so Beloved and I never had plans to go here. My uncle and aunt, however, frequents this place and loves it. They brought us along for the said celebration. Although it has “Ramen” in its name, we quickly found out that it wasn’t a ramen-only restaurant. In fact, it only has a page of their pretty sizable menu dedicated to ramen over other Japanese dishes. However, there are plenty of Ramen offerings. I did notice that there was a lack of non-ramen noodle dishes, such as soba and udon. Being a ramen aficionado, I know that pork is what goes best in it. My uncle recommended I get their Chasyu Ramen (275 Php), which is basically their house specialty, the Ajisen Ramen, only with more pork. Beloved got their Hiyashi Ramen (255 Php), which piqued the curiosity of both my uncle and aunt. My aunt and uncle also ordered a feast for the rest of us, consisting of multiple orders of Agedashi Tofu (88 Php), California Maki (195 Php), Chahan (188 Php), Chirashi Sushi (335 Php), Crazy Roll (395 Php), Ebi Tempura (225 Php), and Kani Salad (128 Php), among other stuff that I forgot to picture and take note of. Since it was their specialty, I’ll start with that. Their Chasyu Ramen, although not as big as the biggest ones I’ve had, is still pretty sizable, especially for its cost. The toppings were both usual and unusual: it had cabbages, spring onions, hard-boiled soy egg, and grilled pork strips consists the usual bunch; unknown chewy but also savory brown strips comprise the unusual. If I had to guess, I think these were mushrooms. Underneath the savory pork broth was a large amount of ramen noodles, which had one of the best textures I’ve ever had. Pork was pretty delicious too, but I can’t help compare it to the, preference-wise, most delicious pork cuts in ramen I’ve tasted in Ramen Bar. Of course, that place has a more expensive tag to go with it, so this soup’s pretty great in itself. Beloved’s Hiyashi Ramen had a similar approach—lots of noodles plus some toppings. It also came in a hilariously large and fancy glass bowl. Difference is, aside from the choice of toppings and medium of serving, instead of soup, this one had a soy-sesame sauce. 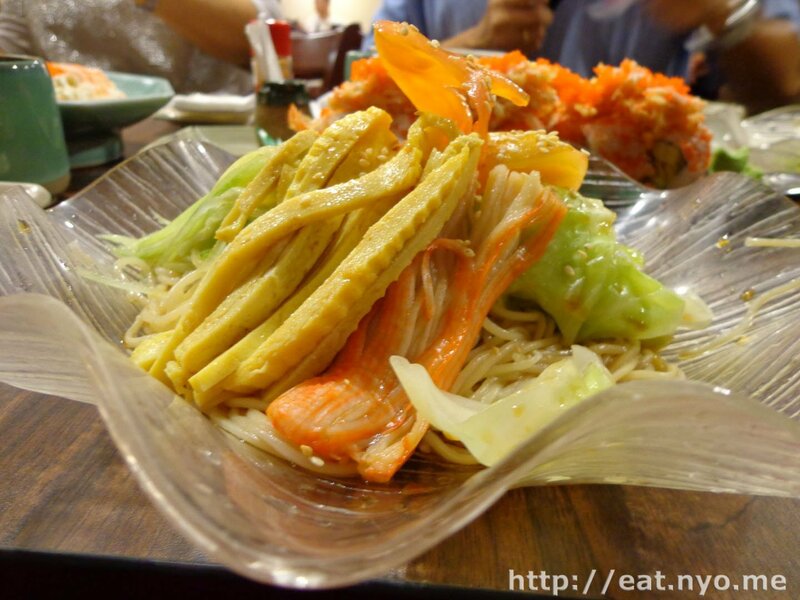 Toppings consist of long slices of tamago-slash-scrambled egg, crabsticks, cucumber, ham, and cabbage. Beloved comments that it was more mild-tasting compared to the competition, and that there was relatively little toppings compared to the amount of noodles. I noticed that they really emphasize their noodles, which was probably the store’s specialty and reason-to-go here. She didn’t enjoy it as much, I’m sure, since she prefers the thicker udon noodles they sadly don’t offer, and a sweeter sauce to go with it. My aunt and uncle, on the other hand, liked the refreshing taste it had. As for the rest-of-the-stuff, I’ll enumerate one by one and to the best of my memory. 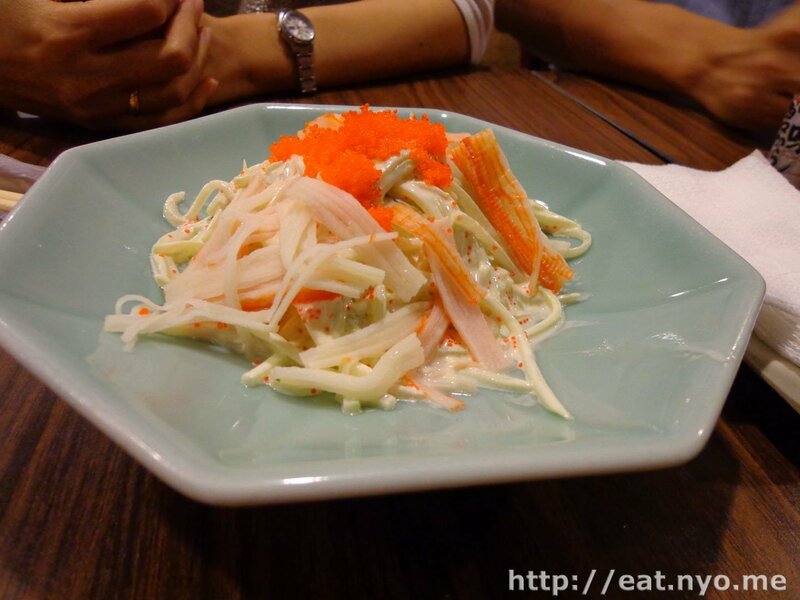 This is their Kani Salad. A simple dish comprising of cucumber shavings, greens, and the aforementioned kani or crabsticks, topped with roe, flying fish, I believe, and mayonnaise. Refreshing, but it must be consumed immediately since the cucumber will make it watery if left for a while. Above is their California Maki. It had the usual ingredients of mangoes, cucumber, and crabsticks to give the wonderful texture and taste contrast, all wrapped with a sheet of nori, or seaweed paper, and sushi rice covered in roe. 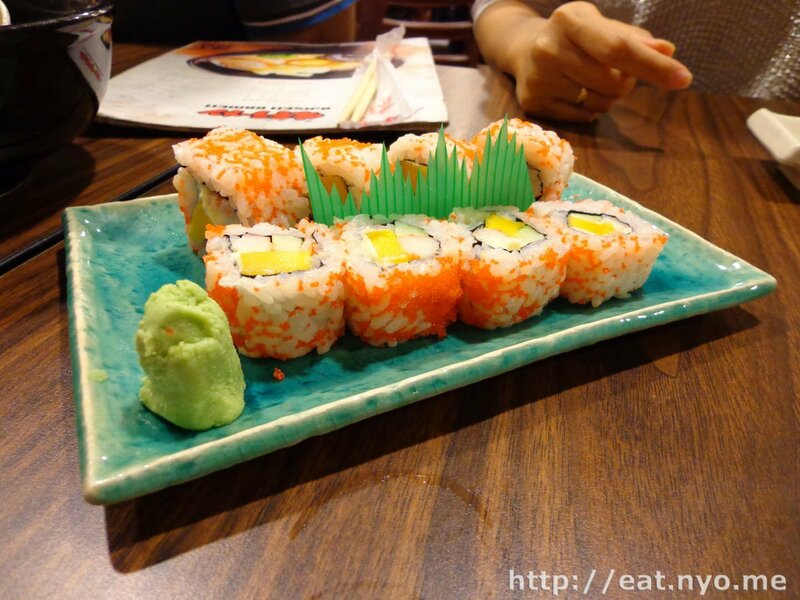 It’s not much different from the usual Cali Maki you get elsewhere, but this one’s noticeably fresher and a bit larger. Above is their Crazy Maki. Aunt and uncle admitted that they don’t really enjoy this as much, but thought it would make for a good picture. 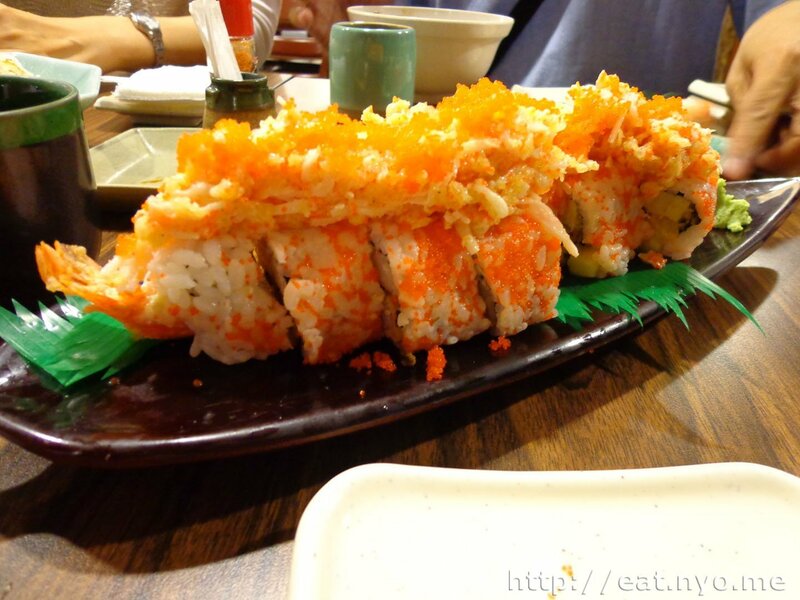 A pretty huge roll, it was similar to a California maki on the outside, except it was topped with crunchy tempura batter and roe. Inside is where much of the difference lies. Honestly, I’m not sure if it was ebi-slash-shrimp tempura, since it tasted more like crabmeat, I’m pretty sure it was some sort of tempura. Next stop, their Chahan. 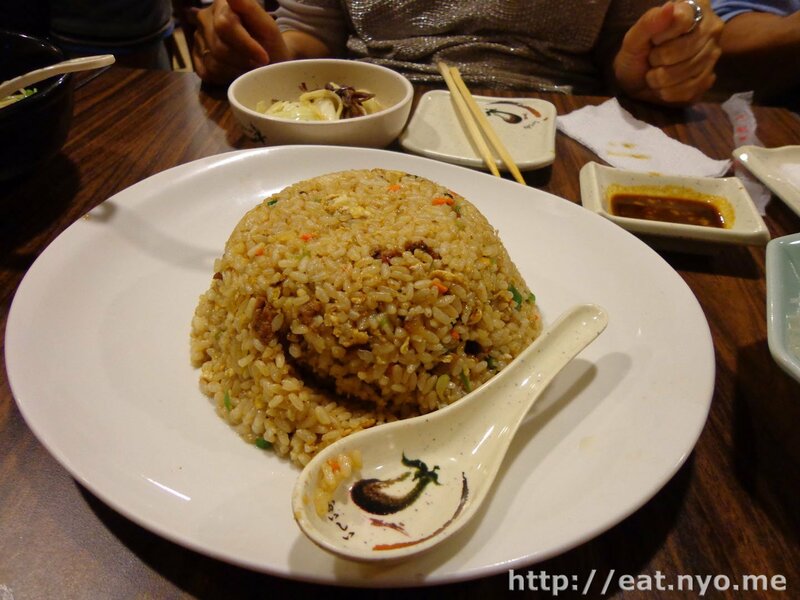 It’s basically soy-fried rice with toppings in it. Even though I’m not fond of rice, surprisingly, it turned out to be pretty good. It had bits of delicious pork among the usual egg and carrots you find in fried rice, which I think made it quite special. It’s also quite a large serving, similar to their other dishes, such that even though we only had two orders, all eight of us managed to have a serving. Next is their Chirashi Sushi. This is basically a donburi version of a sashimi platter, replacing normal Japanese rice with sweet-sour sushi rice. 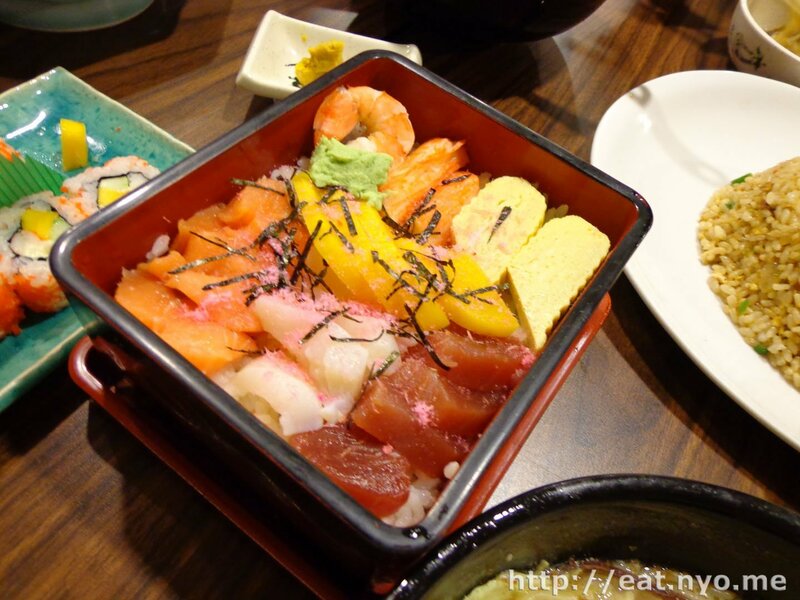 The toppings included were salmon and tuna sashimi, tamagoyaki or scrambled eggs, shrimp, squid, and pickled radish. It also had pink stuff, which made whatever it covered a bit sweeter. Sadly, I compared to the other dishes, I found that the tuna was not as fresh and was frozen beforehand. The salmon, however, was fresher. The box was deceivingly big, but it only had a thin layer of rice with it, so it’s really among the lesser dishes quantity-wise from our orders. I guess the premium comes from the good-on-its-own sashimi cuts. The Agedashi Tofu, although priced below 100 Php, was still plenty. Each order had sizable cuts of deep-fried tofu smothered in sauce. The sauce was not as sweet as I’m used to, and I have reason to believe they used tempura sauce for this. It was a bit hard to eat with just chopsticks. Luckily, I had a soup-drinking spoon with my ramen. Similar to the salad dish we had, this one had to be consumed fast since it gets a bit soggy if left a while. 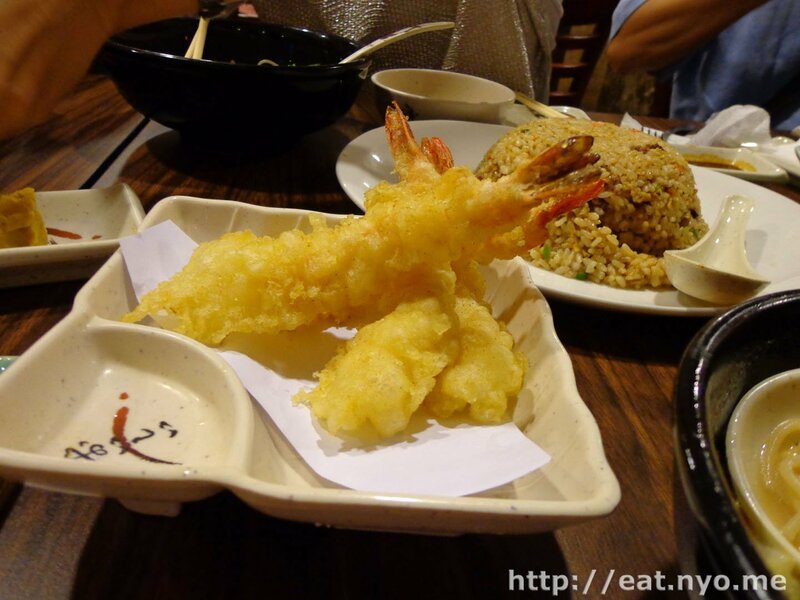 And then, there’s the Ebi Tempura. Each order had four shrimps, which was the “normal” price, I guess. The batter covering it was noticably yellower, and was, in fact, tastier than I’m used to. Luckily, it didn’t overpower the yummy shrimp it encapsulated. We ordered a lot, and I have no idea how much we exactly spent. If I had to estimate, it would be somewhere between 600 to 1000 Php per person, so let’s round it to 800. Not bad, I suppose, for the amount of food we had. 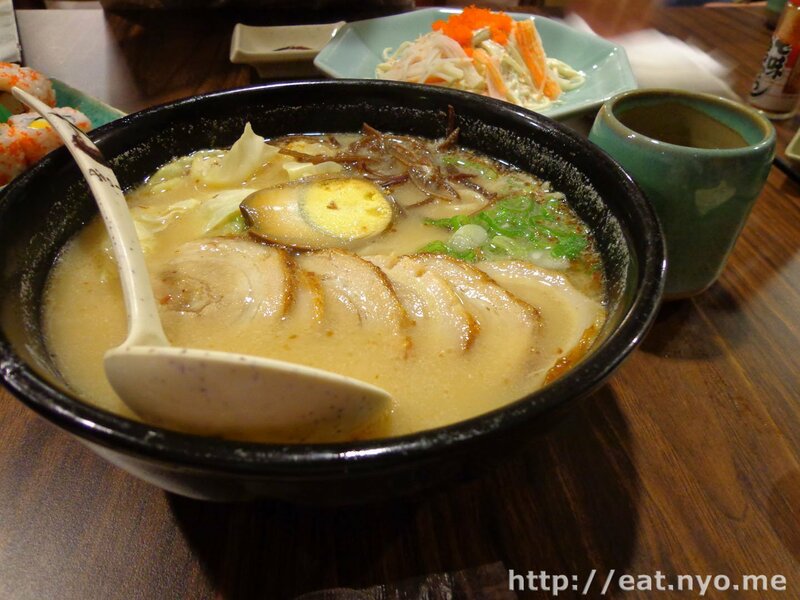 This place certainly appeals to large groups, especially families, since all their dishes, including their ramen is good for sharing. Also, despite the “ramen” in its name, this is an all-around Japanese restaurant. In fact, we found out later that you can add 25 Php to turn your ramen into udon, which I think Beloved would’ve preferred to have learned earlier. Priced just right, and tastes, although not spectacularly different, just right as well. Overall, Ajisen Ramen is worth the feast. Location: Square Tirad Pass St. corner Sto. Domingo St., near Banawe. 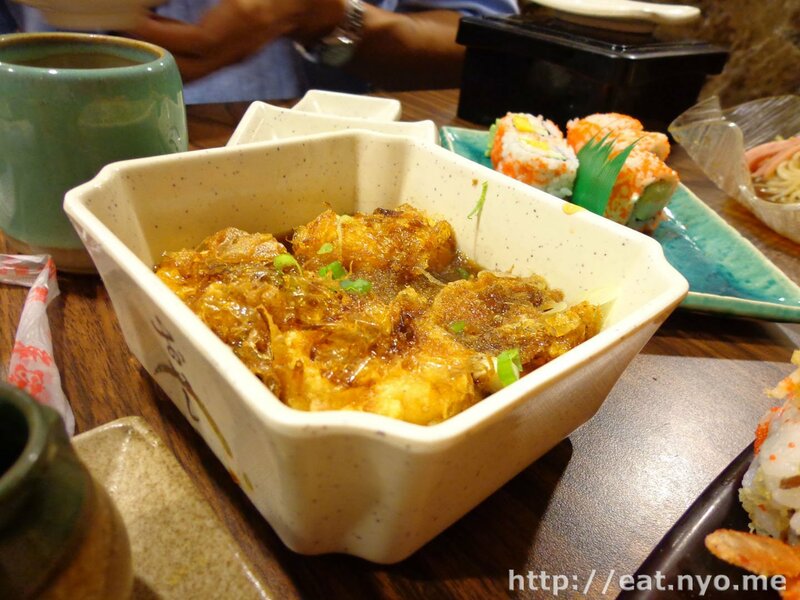 Recommended for: Large groups of Japanese food lovers. Not recommended for: Japanese food haters. Smart nomnomnom tip: The yellow stuff is wasabi; you can add 25 Php to turn your ramen into udon.